Last weekend I conducted research for the new handout for my “Blend It” class at Quilting by the Lake (QBL) in mind. I generally start my research in my own extensive library, and whenever I scan the spines lined up neat (and sometimes not so neat…), I feel I am reacquainting myself with old friends, very good friends I might add. 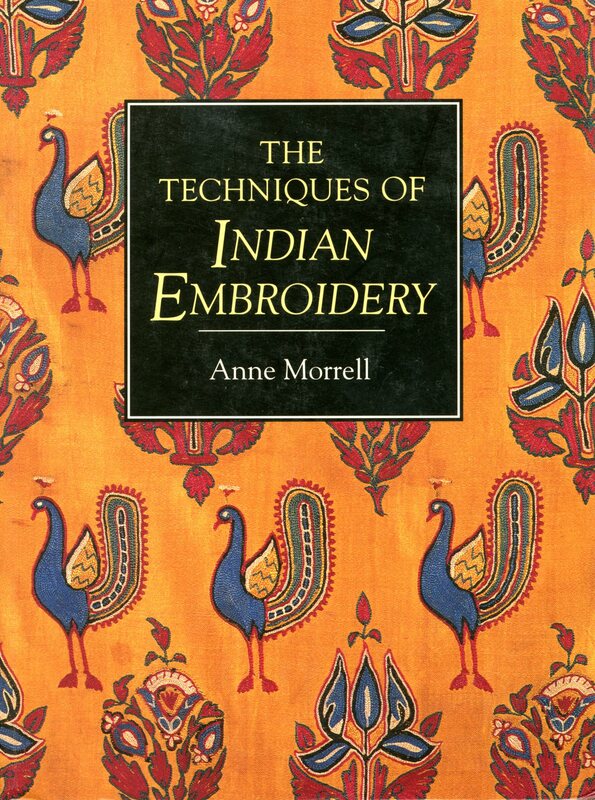 I pulled “The Techniques of Indian Embroidery” because I recalled several images and background information about silk fabrics. How quickly I got side tracked. The silk information was soon overlooked as I devoured the images of hand embroidery stitches, including Kantha stitch samples, for the rest of the afternoon. I have owned this resource book since the mid-90s and must admit it is one of my favorite go-to resources when it comes to embroidery in general. The book is packed with concise and excellent indepth information. The images are captivating and encompass a range of embroidered textiles, antique to contemporary complete with detailed stitch diagrams in sketch and image capture breaking down compound stitches for the purpose of recreating. The book’s contents cover the historical background, various embroidery stitches, quilting, darning and pattern darning, counted-thread work, white work, mirror work, metal embroidery, embroidery with the tambour hook, applique and patchwork, various stitch techniques and an extensive bibliography for additional reading. I have “fallen” for this book all over again, I am not sure how many times one can do that with a book… As a result I have packed it for our four weeks on the road (starting this morning). Indian Embroidery has always held a special interest for me, and with the popularity of my Kantha e-book I feel I might be on to something. I am not working on one large piece, I will bring along some smaller pieces of fabric to experiment with. I won’t make any definite promises but if I can come up with something exciting I will share pictures in upcoming blog posts. Are you interested in your own copy? I understand it is long out of print, but used copies can still be obtained, and here is the good news: an e-book format appears to be available as well. The book has received outstanding reviews, all 5 stars!! Click on this link to get to the publishing info. Disclaimer: I am not affiliated with Amazon.ca and do not gain financially if you decide to buy. 19 May	This entry was published on May 19, 2015 at 6:21 am. It’s filed under Art, Book Review, Creativity Update, Design, History, Journaling, Motivational, Networking, Product review, Refocusing Creativity, staying in touch, Travel and tagged Anne Morrell, book review, hand embrodiery, hand quilting, Indian Embroidery, Interweave Press, Kantha, sharing resources, The Techniques of Indian Embroidery, travel and creativity. Bookmark the permalink. Follow any comments here with the RSS feed for this post.